The AJSAE showcases artwork created by students enrolled in studio courses at Meredith College. These majors and non-majors works represent the diversity our studio program offers. 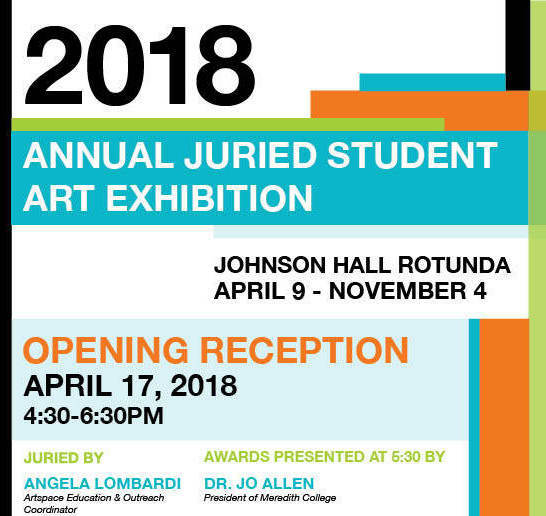 This year, selected works in ceramics, drawing, fibers, graphic design, painting, photography, printmaking and sculptural mixed media forms were juried in by Angela Lombardi. Lombardi is the Educational Outreach Coordinator for ArtSpace as well as a practicing artist.